Is the current system of governance in ANY country based on the will of the people? the answer is a resounding NO!!! Why cling to a constitution and charter with hidden occult meaning? And, which raises only argument and contention? And, based on hearsay evidence? there being no living party to that odious contract; is it not time for each state to write a new one? How many times have you heard references to “the Pope”? All your life there has been a Pope, right? And right along beside that, how many times have you heard references to the Pope as “the Roman Pontiff”—-? He rolled his eyes heavenward with an aggrieved expression on his face. I am not sure if it was the result of his reflections about the Pope and the Pontiff or the ongoing ordeal of having to answer my questions every day. This just goes to show that the United States are not independent; and, why file a petition? Why not file a Declaration of intent? or Independence? ¶¶ THE REVELATION of S. Iohn the Diuine. 1 And there came one of the seuen Angels, which had the seuen vials, and talked with me, saying vnto mee, Come hither, I will shew vnto thee the iudgement of the great Whore, that sitteth vpon many waters: 2 With whom the kings of the earth haue committed fornication, and the inhabiters of the earth haue beene made drunk with the wine of her fornication. 3 So he caried me away in the Spirit into the wildernesse: and I saw a woman sit vpon a scarlet coloured beast, full of names of blasphemy, hauing seuen heads, and ten hornes. 4 And the woman was arayed in purple and scarlet colour, and decked with gold, and precious stone & pearles, hauing a golden cup in her hand, full of abominations and filthinesse of her fornication. 5 And vpon her forehead was a name written, MYSTERY, BABYLON THE GREAT, THE MOTHER OF HARLOTS, AND ABOMINATIONS OF THE EARTH. 6 And I saw the woman drunken with the blood of the Saints, and with the blood of the Martyrs of Iesus: and when I saw her, I wondred with great admiration. 15 And he saith vnto me, The waters which thou sawest, where the whore sitteth, are peoples, and multitudes, and nations, and tongues. 16 And the ten hornes which thou sawest vpon the beast, these shall hate the whore, and shall make her desolate, and naked, and shall eate her flesh, and burne her with fire. 17 For God hath put in their hearts to fulfill his will, and to agree, and giue their kingdome vnto the beast, vntil the words of God shall be fulfilled. 18 And the woman which thou sawest, is that great Citie which reigneth ouer the kings of the earth. 9 And the Kings of the earth, who haue committed fornication, and liued deliciously with her, shall bewaile her and lament for her, when they shall see the smoke of her burning: 10 Standing afarre off for the feare of her torment, saying, Alas, alas, that great citie Babylon, that mighty citie: for in one houre is thy iudgement come. 11 And the Merchants of the earth shall weepe and mourne ouer her, for no man buyeth their merchandise any more. 23 And the light of a candle shall shine no more at all in thee: and the voice of the bridegrome and of the bride shalbe heard no more at all in thee: for thy Merchants were the great men of the earth: for by thy sorceries were all nations deceiued. 24 And in her was found the blood of Prophets, and of Saints, and of all that were slaine vpon the earth. 2 For true and righteous are his iudgements, for hee hath iudged the great whore which did corrupt the earth with her fornication, and hath auenged the blood of his seruants at her hand. 3 And againe they sayd, Alleluia: and her smoke rose vp for euer & euer. 19 And I saw the beast, & the Kings of the earth, and their armies gathered together to make warre against him that sate on the horse, and against his armie. 20 And the beast was taken, & with him the false prophet, that wrought miracles before him, with which he deceiued them that had receiued the marke of the beast, and them that worshipped his image. These both were cast aliue into a lake of fire burning with brimstone. 21 And the remnant were slain with the sword of him that sate vpon the horse, which sword proceeded out of his mouth: and all the foules were filled with their flesh. 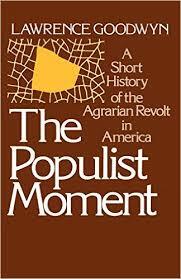 The Populist Moment describes the rise and fall of the 19th century populist movement, the largest mass democratic movement in US history. At its zenith during the 1896 election, the populist People’s Party had two million members. Author Lawrence Goodwyn credits the rise of the agrarian populist movement to two major factors: 1) the unwillingness of the Eastern banking establishment to issue adequate credit to small family farmers and 2) the sudden contraction of the money supply caused by pressure on the post-Civil War government to repay bonds it floated for $450 million of treasury notes (aka Greenbacks) Lincoln used to pay for the civil year. The Holy See has issued a statement Tuesday in response to “attempts by the Order of Malta to discredit” the new group established by the Vatican to conduct the investigation of why the Chancellor of the Order of Malta was asked to step down. Looks like Rome is trying too cover Francis’ tracks; the question is: how was he involved? A tribunal in Rome, Italy, today sentenced two former heads of state and two ex-chiefs of security forces from Bolivia and Peru, and a former Uruguayan foreign minister to life imprisonment for their involvement in the coordinated, cross-border system of repression known as “Operation Condor.” The National Security Archive, which provided testimony and dozens of declassified documents as evidence to the tribunal, hailed the ruling. Today’s posting on the Archive’s web site includes several exhibits from the trial. Call to Fight for Thembu Pride – Daily Dispatch press article Tuesday 3rd January 2017. BANTWANA Abahle (Good People), I would like to convey my message of inspiration for the year 2017. I pray that you will enter the New Year with the spirit of patriotism and remember what our fallen ancestors died for. Your identity and Africans cannot be reducedo political heroes, even though we appreciate the work they did to liberate you. It must be stored in your minds that we still have a long way to go, be mindful of the Western influence that is entrenching itself into the soul of Africans, capturing every mind, eroding cultural identities.